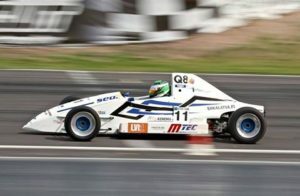 Our team has at the moment a Mtec FD09 available for testing or racing. The car is serviced thoroughly and is maintained by Mäkelä Racing Team. The car has won the Finnish Championship title in 2014 and silver in Finnish Championship and Eurocup in 2015. During a test day you will learn the basics of driving a formula car and drive about 50 effective laps depending on the starting level and development of the driver as well as the weather conditions. Before the first test day it is adviceable to spend one day at the Mtec factory to make a seat, set up the pedals etc and get to know to the car. This way it is possible to make the most of the day on the track. Usually the test day are held in Kemora, which is the hometrack for the team but it is possible to test also on other racing tracks in Finland. The driver is responsible of themself and the price of the test does not include any damage to the car caused by an accident on track or handling mistake. It is possible to desing a package for the race weekend which includes testing on the track on the week before the race if the track is open for practise at the time. If you are willing to drive a test or a race please contact us and ask for a quotation. Every driver is different and everyone has different goals, so we tend to make a package with each driver individually to assure the best possible experience.